Artificial intelligence and robotics have been evolving in nursing for some time. We are planning to feature articles in this issue that address the relationship of artificial intelligence and robotics to patient outcomes and quality of care from a nursing perspective. We welcome philosophic analysis, including ethical implications, empiric research reports, and the development of innovative methodologies related to artificial intelligence. Articles must focus on the development of nursing knowledge that informs nursing practice, education and research. The significance of nursing perspectives has gained renewed interest as social pressures to reform healthcare have created challenges for care that is more effective, more effective and more economically sound. In both theory and in practice, nursing offers possibilities that address each of these goals. We are inviting articles that address the state of the art of nursing theory as we approach the third decade of the 21st century, revealing important contributions that nursing brings to create needed change. ​ We welcome articles addressing the full range of theoretic development: articles that report empiric research structured from existing nursing theories, philosophic analyses related to theory and knowledge of the discipline, critiques of existing theoretical approaches, and descriptions of new and evolving nursing theories. Even though the ideal of practice based on evidence has flourished over several decades, the achievement of consistently sound practice, in nursing and in other disciplines as well, still eludes even the most well-intentioned practitioners. For this issue of ANS we seek manuscripts that explore this dilema, examing questions such as ‘what constitutes evidence?” and “what constitutes the best evidence?” We also seek manuscripts that provide exemplars of best evidence and best practices. We seek innovative approaches to knowledge development in relation to all patterns of knowing in nursing. We also welcome manuscripts that critique any methodologic approach, manuscripts that explore the philosophic, including ethical underpinnings related to the development of nursing knowledge, and manuscripts that address the critical connections between practice and knowledge development approaches. One of the trends of our time is the development of “precision science” – a trend that deserves careful consideration going forward. We seek manuscripts for this issue that provides assessment, explanation, evaluation and critique of this trend in light of the underlying foundations of nursology. This featured topic intentionally calls for both rigor and creativity that provides avenues for discussion and possible new directions in the development of our discipline. The idea for the Nursing Knowledge Pyramid started in the fall of 2012 when I was in my first semester of a Doctor of Nursing Practice (DNP) program at Wayne State University. I was going to school full time and working full time. I was (and still am) living in Orlando Florida and I attended my courses synchronously on-line. The internal visual I maintain from this time includes seeing my cohort in their classroom seats in downtown Detroit, while I was in front of my lap top video cam in the den of my home, in sunny Florida. Most of the time, my fellow classmates would instant message me that they were a little jealous of the weather. I was taking a course on foundations in nursing from doctors Nancy George and Rosalyn Peters when my work on knowledge development started. I was trying to get my head around integrating philosophical and theoretical perspectives of nursing to create a solid foundation for nursing practice and meet the requirements of an assignment for the course, which included a very detailed rubric. The paper I submitted to my professors was titled Toward a Theory of Cancer Coping. I titled it after Imogene King’s 1971 – Toward a Theory for Nursing: General Concepts of Human Behavior in mind. It made sense to me because I realized my ideas weren’t fully established yet, but I had made a solid start. This first document included a concept map that aligned King’s conceptual system with my own nursing system model, which included the Nursing Knowledge Pyramid. Over the next two years, nearly every assignment even remotely asking for use of theory, I would continue to enhance and better define this work. As many of you know, DNPs are required to complete projects rather than the traditional PhD dissertation. To meet the requirements of my program, I completed two projects. A clinical performance improvement project (Decker, Howard, G.S., Holdread, H., Decker, B.D., Hamilton, R.M. 2016). and a theoretical application by developing a practice theory called Substructing a Cancer Coping Rule-base, which included the Nursing Knowledge Pyramid. The Nursing Knowledge Pyramid (NKP) is a practical approach to support nursing practice. In my DNP program I was able to use the pyramid as a means of bridging the gap between theory and practice. As an experienced psychiatric mental health advanced practice nurse (APRN), I could operationalize the research project by methodically going from abstract knowledge (bottom of the NKP) to the concrete knowledge (top). The abstract level of the project was my knowledge as an APRN developed over my 30 years of experience. The middle tiers indicate the theoretical underpinnings and evidence-based practice. The most concrete knowledge at the top of the pyramid was the rule-base used to offer my patients coping strategies to handle their distress. Most recently we utilized the NKP to help develop the key conceptual relationships and theoretical foundation for a case study where the patient had an unrealistic fall risk appraisal. The patient was treated with a feedback strategy to reframe her perception of risk of falling. I’m interested in feedback from others who are considering using the NKP in their research. Decker, V.B., Howard, G.S., Holdread, H., Decker, B.D., Hamilton, R.M. (2016). Effects of an Automated Distress Management Program in an Oncology Practice. 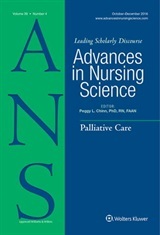 Clinical Journal of Oncology Nursing, 20(1), e9-15. King, I.M. (1971). Toward a Theory for Nursing: General Concepts of Human Behavior. New York, NY: Wiley. “The Sexual Health Empowerment (SHE) for Cervical Health Literacy and Cancer Prevention study team, December 2017: (Back row) Katherine Gwynn, Amanda Emerson, Molly Allison, Brynne Musser. (Front row) Joi Wickliffe, Megha Ramaswamy (PI), Shelby Webb. Used by permission. University of Missouri-Kansas City) to become part of an interprofessional team (RNs, public health professionals, health educators, medical residents, social workers, a sociologist, and even a historian!) doing cervical cancer prevention research led by Dr. Megha Ramaswamy (PI) at the University of Kansas Medical Center, and my mentor Dr. Patricia Kelly (Co-I) (UMKC). The Sexual Health Empowerment (SHE) study, funded by the National Cancer Institute, sought to learn whether a interactive, trauma-informed, small-group intervention centered on cervical health literacy and feminist principles would increase up-to-date Pap screenings among women detained in county jails. We implemented the program with successive cohorts of women over 2 years beginning in 2014 and have been following up for 3 years. In addition to my role in the intervention itself, I took part in an ethnographic sub-team that conducted interviews and participant observation with a group of volunteers in the community after their release. The Advances in Nursing Science article reports on a series of particular interviews I conducted with those women. We were initially impressed by the variety of strategies women used in highly challenging circumstances (i.e., poverty, physical and emotional abuse, child separation, even during incarceration) to get and give social support to one another. In my analysis of the interviews—a course of coding, reiterative reading for themes, memoing, discussion with team members—a particular set of stories coalesced. Almost to a woman, the participants in our follow-up research struggled to find secure housing when they returned to the community. This basic need drove many of the stories they told, organizing how they perceived and interacted with others and impacted how they understood choices related to their health and safety. It bears noting that I have a background in literature as well (PhD, 2004) where I learned to recognize the power of stories to give form to versions of self and other, to shape feeling and motivate behavior. The stories about shelter-seeking told by women with histories of repeated incarcerations in this study were not long, but they were rich in implications for the women’s health. The analysis I present in this narrative inquiry maps a couple key trajectories the stories about shelter seeking take and serves as a call to nurses who work with women in the community who may have backgrounds involving incarceration. I urge nurses to listen up, to make stories part of the assessment. As my analysis illustrates, those narratives can carry otherwise unavailable information about threats to health and safety and open up valuable opportunities for nurse-led education and advocacy. in dementia care. She has a PhD in Health Science from Norwegian Science and Technology University (NTNU). Currently she works as an associate professor at the Department of Nursing and Health Sciences at Nord University (NU). Her research has mainly concerned issues such as the mental health of informal caregivers of patients, and how social support affects the caregivers’ caring burden. This article is available to download at no cost while it is featured! We invite all comments and ideas related to this work – leave you message below!